Working with the natural pigments of watercolour, I find inspiration in the beauty of the natural world around us. I work hard to breathe life into my subjects, recreating them in vibrant, expressive and contemporary paintings. My art is a lifelong learning journey to better bring to life the movement of wildlife, or the softness of light on an evening landscape. My challenge is to communicate the joy I feel when out in nature, or in the presence of a beautiful animal, through my work. Karen’s award-winning contemporary art, exhibited nationwide, focuses mainly on wildlife and other nature-inspired subjects. 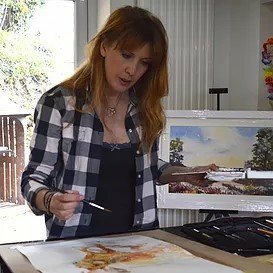 A Devon based artist, her expressive style sits perfectly with her chosen medium of watercolour. Luminous, spontaneous and unpredictable, the tendency of watercolour to produce ‘happy accidents’ simply adds to its allure.